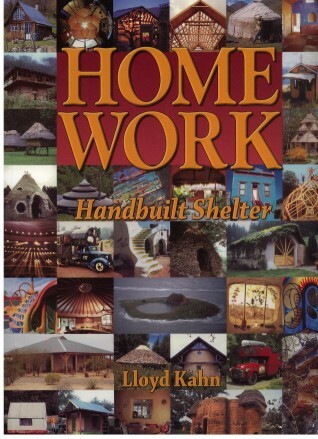 After years of waiting, I finally held a copy of Home Work: Handbuilt Shelter by Lloyd Kahn in my hands. I have rarely been this enthusiastic about a book, and not just because I am in it! Ever since his first publication of Shelter in 1973 (which I also contributed to), Lloyd has been collecting imagery and stories for this eventual sequel. 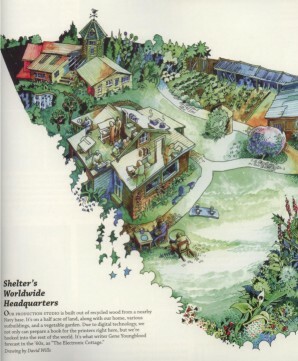 Shelter, a black and white over-sized catalog of unusual building, has become legendary as a book of inspiration for several generations of free-spirited home builders. The fact that it is still in print after 30 years attests to the durability of its significance. This seminal book heralded the emergence of geodesic domes and strawbale homes, as well as the influence of vernacular building styles from around the world on North American Architecture. With Home Work, Lloyd has gone beyond the glory of his earlier work in many ways. Not only does it seem more comprehensive, but it is almost entirely in color. This is a sumptuous coffee table book that will likely not spend much time on the table, since it is so intriguing you just want to pick up and browse through it. Every page is chock full of fun, unusual, lyrical, quaint, artistic, humble, elegant, practical, colorful, whimsical, well-crafted, funky, traditional, and outlandish buildings that were lovingly built by the hands of those who reside there. All of this is presented with Lloyd's casual style of layout and commentary that is reminiscent of a scrap book. Many of the photos are actually collages of several exposures spliced together to create expansive murals. Flipping through the pages of Home Work will take you back to the early days of hippie huts and forward to the cutting edge of natural building technology. The builders themselves are portrayed as lovingly as their buildings, with many profiles of fine craftsmen and women sprinkled throughout. In fact, the book begins by featuring the work of ten artisans who represent some of the best in this tradition of owner-builders. Then a whole slew of other specific homes are displayed in such a way that the lifestyle of their occupants is embedded directly within the imagery. This book depicts far more than architecture; it shows entire ways of life. Half a dozen people who have dedicated their lives to the promotion of natural building are profiled, along with some of the fruit of their labors. It is in this section that Rosana and I find ourselves, with a description of our earthbag/papercrete home. What an honor it is to be part of such a fine work of art as this book. We are in the company of Bill and Athena Steen, Catherine Wanek, Ianto Evans and Linda Smiley, and others. Lloyd has included examples of a variety of world-renowned photographers whose work graces the pages with imagery from India, Mongolia, Togo, Indonesia, Vietnam, Venezuela, New Guinea, Greece, Hong Kong, Nepal, Bali, Germany, Thailand, and Turkey, among other places. The way these exotic places are merged with the more familiar North American imagery makes everything seem exotic, or in another way of seeing, it all seems quite normal. 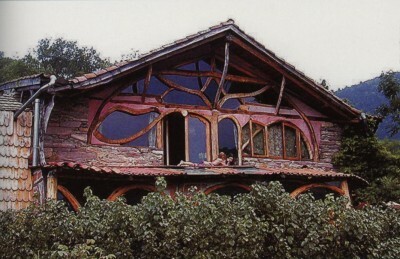 There is a section of buildings that derive their inspiration from fantasy and whimsy. 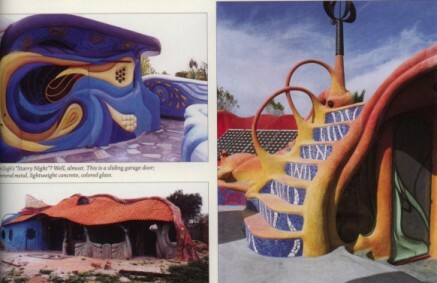 This includes the surprising and almost garish flying concrete work of Steve Kornher in Mexico, along with a sculptural home carved out of the Arizona desert created by Michael Kahn, Lloyd's cousin. A Nevada house made of recycled glass bottles contrasts with delicate tropical treehouses in Hawaii and China. Then we go on the road with Lloyd, as he chronicles trips that he made over the last 30 years. He photographed country homes that caught his eye along the Mississippi River, lovely and simple architectural elegance in Nova Scotia, old farm buildings of Utah and Nevada, tropical abodes in Costa Rica, and simple living in Baja California. Continuing with the tradition that Lloyd established in the original Shelter book, there are a bunch of images of unusual housecars or rolling residences. My original school bus home was featured in the first book. 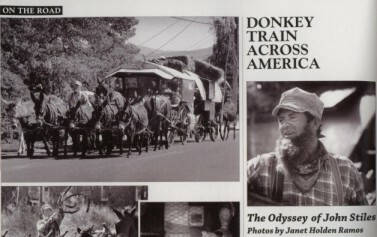 This time there is a donkey train pulling a rolling homestead, complete with goats and chickens. There are several gypsy wagons, both self-propelled and not. There is log home on wheels, as well as various buses and vans. Lots of fun. 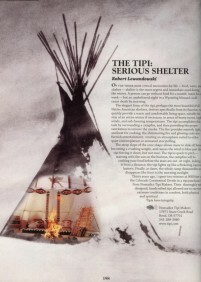 A chapter on living lightly features descriptions and diagrams of tipis, yurts, tents, make-shift structures, and traditional native American homes. 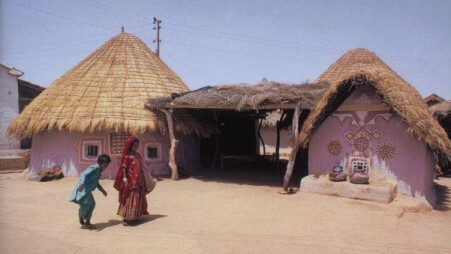 There is enough information in these pages to be able to construct many of these dwellings. Another love that Lloyd manifests is for old barns of all types. There are photos and diagrams of many of these fine buildings. 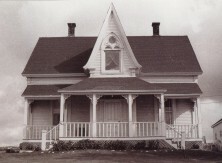 In fact old buildings of all sorts attract his eye, and we see them from Oregon to Nepal, and from Hungary back to California, where Lloyd still resides in a funky little place on the coast of Marin County. Thank you Lloyd Kahn for such a wonderful trip! If you would like to own your very own copy of this inspirational book, I carry them here at the store. As a special offer to E-zine subscribers, you can obtain a copy for 10% off the regular retail price of $26.95, or $24.25, until the end of June, 2004. Just indicate that you would like the 10% discount in the comments field when you place your order. I guarantee that you will not be disappointed! Greenhomebuilding.com E-zine is copyright Hartworks, Inc. 2002. Please feel free to use excerpts from this newsletter as long as you give credit with a link to our homepage http://www.greenhomebuilding.com .